Mosquitoes... Aside from being a nuisance, mosquitoes in the Islands can carry a very unpleasant viral infection called Dengue Fever. The classic symptoms of nausea, severe muscle pain, and high fever should prompt you to seek immediate medical attention. It is not extremely common, but it is worth using an effective repellent with DEET, or Picaridin . (See some DEET warnings at the bottom of this page.) Areas where water pools to stagnation out of the trade winds are of more concern. It is also said that the biters are more active at dawn and dusk. Although the wetter months of August through November tend to be a bit worse, mosquito season is a year-round affair. It often depends on the recent weather. An easy search on the Internet will give you more than you really want to read about this disease. Anchor in "the trades" and use a little repellent. The odds are in your favor. The mosquito that carries Dengue is most active first thing in the morning after sunrise, and in the late afternoon, so it would follow that hikers seem more at risk than sailors. However, Dengue transmission after dark is certainly possible, so be safe and stay protected. Personally, I had never had a bad trip, with regard to skeeters, but it can happen. Note: There are two substances, "Picaridin" and the oil of lemon eucalyptus that have been endorsed by the Centers for Disease Control and Prevention (CDC) and The World Health Organization as effective and non-toxic, natural alternatives to DEET. This is a great news in disease prevention. Even "Cutter," one of the biggest of DEET users, was one of the first to create a product using Picaridin. Now, Avon and other companies sell repellents using this nontoxic alternative. It is probably more effective and is better tested than the eucalyptus oil, but they are both worth considering. These products are a little hard to find in stores, but Amazon and REI.com sell both Cutter's Picaridin product and Repel's lemon eucalyptus product. Oil of lemon eucalyptus and Picaridin are nontoxic ; furthermore, they work on things made of plastics, synthetics, and sealants (clothing, camping gear, etc.) without damaging the material. DEET will damage many synthetic materials, and really works best when applied directly to the skin. Sand fleas and noseeums... These guys are mostly a problem on sandy beaches, especially in early morning, late afternoon, and evening. Some beaches seem remarkably free of them, and some people don't seem as tasty to these little fellas. However, most people will be feasted on if they are in the wrong place, and unprotected. Light repellents like "Skin-So-Soft" or citronella lotions seem to work fine, however, if you are concerned about mosquitoes as well, you might as well go for the DEET. Jellyfish... 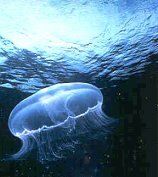 These are mainly a summer phenomenon (July, August, September), especially the "moon jelly". Most people do react. Do NOT rub the affected skin, but leave the tentacles in place, and flood the area with vinegar to neutralize the reaction. Then gently remove any remaining tentacles. Vinegar should be a standard provision on any boat. 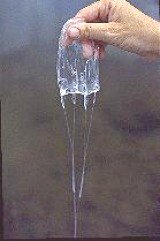 If you are stung by the more treacherous "sea wasp," or "box jelly," a box-like jelly fish with four hanging tentacles (below), local authorities recommend that you call or radio VISAR. Immediately to ask for advice and to help monitor the reaction of your victim. These can can give you a pretty bad reaction. These nasty creatures are relatively rare, but sometimes appear shortly after a severe storm or hurricane, and some summer nights (according to certain lunar and tidal patterns - e.g. 8-10 days after the full moon). The Caribbean box jelly is not the same species as the infamous and deadly Australian variety. Furthermore, jellyfish are not aggressors - you have to bump into them, "All At Sea" online magazine has a good article dealing with jellyfish in the BVI here . Also, here is a good description of a product called Safe Sea an effective lotion that protects against jellies, sea lice, and fire coral (see more info below). Sea Lice... This is really a misnomer, because sea lice are actually different beasties altogether. Although more common in Florida, outbreaks have been reported in the BVI from time to time. Thought to be the larvae of thimble jellyfish, it seems that some folks react more than others. At any rate, swimming through a swarm of these barely visible nasties can create a very red, acne-like rash in many people, especially in skin areas under pressure (under bathing suits, skin folds, T-shirts). It's not really the immediate contact with the larvae that causes the rash. They fire off nematocysts when trapped on your skin by clothing. Also known as "seabather's eruption," these tiny critters (the size of a grain of pepper) tend to be a seasonal and episodic phenomenon. To treat, wash your body and wet clothing with soap and fresh water, and use your favorite anti-itch application. Although there are special lotions designed to shield your skin if you are going to swim in an infested area, sunblock is thought to help some in this respect, as well. Folks put a barrier solution on their skin where the their bathing suit is tight against the skin. Better yet, swim naked! A thorough article can be found HERE. 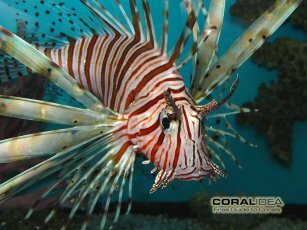 Lion fish... This nasty creature is the poster boy of very detrimental, invasive speices. Native to the Indo-Pacific and Red Sea, they have made their way into Atlantic waters since the 1990's. Released aqaurium specimens are also to blame. Since they have almost no predators of their own, and voracious appetites, they are horribly destructive to life on the coral reefs. They vary in color, but they are pretty unmistakeable. 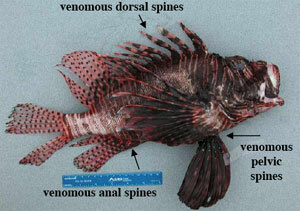 The bottom line here is that they have nasty venomous spines which can cause extreme pain. Do NOT handle this fish. If you catch one, don't throw it back -- cut the line and let it drop into a cooler or box. Report all sightings (locations) to any of the dive companies. Treatment involves soaking in hot water, as heat inactivates at least one of the toxins in the venom, and thus relieves some of the pain. If pain returns an hour or more later, try the heat soaks again. Call or radio VISAR to ask for advice, and to help monitor the reaction of your victim. Here are some great photos here , and a good article here . Fire coral... These hydroids (not actually a true coral) usually appear in a bright orange, fingery configuration that can cause quite a rash. It can be somewhat dull in color, so don't count fully on the orange to tip you off. You shouldn't be touching the coral, anyway. Again, vinegar is a good antidote. Keep your hands to yourself... It's appropriate to mention here that it's good advice NOT to reach out and touch any coral or even some of those cute little fish. The surgeonfish, for example, though not aggressive, has razor-sharp fins that can cut, and even imbed and infect on contact. Since I normally can't distinguish the surgeonfish from some tangs, I don't experiment anyway. Ear Infections contracted from microorganisms in the water are not common, but do happen, especially to those who are prone. Divers recommend a homemade solution of equal parts rubbing alcohol, hydrogen peroxide, and vinegar or glycerin. Squirting a bit of this in your ears after swimming or snorkeling can virtually eliminate the risk. Folks who are particularly vulnerable to ear infections should probably bring their choice in antibiotics, just in case. Sun Rash... Solar dermatitis can appear as reddish bumps, (often itchy) spots, or blisters, showing up hours or even days after the exposure. It can be caused by one's own specific allergic reaction, or can, more likely, be a "photosensitivity dermatitis" due to internal medications or products applied to the skin. It is important to realize that the power of the sun at this latitude (especially through the midday hours) is most probably much more intense than where you live, so do not rule out this problem due to a lack of prior history. If you are on any medications (especially sulfa based antibiotics or anti-inflammatories), find out if they can cause a sun-sensitivity reaction. The antibiotic, Bactrim, is well known for this. Ironically, some folks can even have a sun reaction to chemicals in sunscreen. Click HERE for an informative article on this problem. 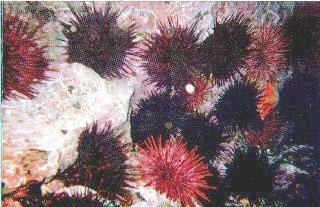 Sea Urchin... 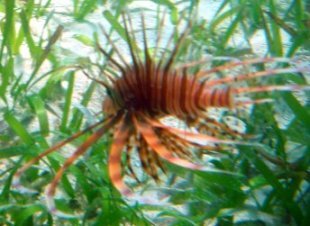 This usually black, spiny critter is very common in the BVI. If you're wearing fins and being good about not contacting the reef, then getting stung is unlikely. If you're in a sandy area, and you just have to put a foot down, buoyancy will allow you to lightly stand on the tips of your fins, keeping you safe. If the sting is minor, elevate, apply hot water, remove fragments, and apply antiseptic. If the wound is deep or complex, get immediate medical attention. Fish Poisoning (Ciguatera)... Ciguatera is caused by a neurotoxin which is only present in reef fish. Symptoms include tingling of the lips, mouth and tongue, itching skin, fever, chills, muscle and joint aches, muscular weakness, vomiting and diarrhea. It's not terribly common, but avoiding meals of reef fish like, barracuda, grouper, snapper and parrot can eliminate any chances of consuming contaminated seafood. Personally, I eat grouper and snapper all the time, but it might be wise to ask if there has been any recent local outbreaks. This is contracted by eating fish, not touching them, so snorkel without fear. Creepy-crawlies... In addiction to spiders, there are occasional sightings of tarantulas and scorpions, but these are pretty rare and tend to be more likely at night in the woods. I have camped many times in the Virgin Islands, and have never actually had the pleasure. Although some folks can have severe allergic reactions, most people will respond to bites in ways similar to bee stings. Snakes that bite are virtually nonexistent. Manchineel (or Manchioneel) Trees... These may not be critters, but they are a genuine hazard. One can come into contact with the toxin (sap) by touching parts of the tree, or even sitting under one in the rain. Trees vary from a few feet to more than 30 feet in height, and have widely spreading, deep forked boughs with small, dark green leaves and yellow stems, and fruit-like small, green apples. The Manchineel tree is also identified by a pinhead size raised dot at the juncture of the leaf and its stalk. They can grow along beaches, so people seeking shade need to keep this in mind. Wash affected skin immediately upon contact. Parents, watch your kids with this one. See here for a great tree page plants to beware of in the Virgin Islands. Barracuda, sharks, stingrays, and moray eels... The incidence of problems with these denizens of the tropical waters is incredibly low. I have found the waters of the BVI to be extremely benign. The most common shark seen on the reef is the unaggressive nurse shark. So relax... you probably face more dangers on the Jersey shore. Night diving, however, will certainly increase the probability of encountering a shark, and even certain jelly fish. Problems with morays and stingrays are usually due to accidental contact, not aggression. If you do happen to catch a glimpse of any of these guys, just keep a respectful distance, and you'll be fine. Birds... see my Virgin Islands bird resource page. People... Violent crimes are still pretty rare in the BVI, although theft has increased somewhat in recent years. There is no question that you are probably a lot safer in the BVI than you are at home, so exercise the obvious cautions, relax, and enjoy the wonderful folks who inhabit these islands! More on Treatments... Click Here to get some great info in excerpts from the book, "All Stings Considered" by Craig Thomas, MD, and Susan Scott. Download the entire e-book for free, Here . DEET works primarily by masking the carbon dioxide we release through breath and skin. Carbon dioxide and other scents have shown to be the primary attractions of many insects including the nasty mosquito. Newer studies show that DEET does have some repellent qualities when applied to clothing, however it can be caustic to certain materials (read below). DEET is a fairly toxic substance that is used in insect repellents in concentrations ranging from 3-100%. When applying directly to the skin, the maximum recommended concentrations for adults is 35%, and 10% for children. A 100% DEET formula is fine for clothing application, but be careful how this clothing is touched. For example, spraying a child's hat may be considered a little riskier than spraying the pant legs, because a child will handle the hat, and perhaps put his hands in his mouth. The standard toxicity warning goes as follows: Some DEET is absorbed into the body through the skin, and there have been instances of allergic or toxic reactions in adults and children. Symptoms can include itching, swelling, blistering, or redness of the skin; and burning or stinging of the lips, tongue, and mouth. If larger quantities penetrate the skin or are swallowed, serious side effects such as slurred speech, staggering, lethargy, irritability confusion, and seizures can occur. Drinking DEET can be fatal. Avoid putting the repellent on children's' fingers and hands to prevent them from swallowing it. DEET in the eyes can cause permanent injury. Recent studies imply high dose risks of brain damage to children. DEET sprays can last for many hours, but rain, sweat, suntan lotion, insect density, and individual body chemistry can all affect the need for re-application. Furthermore, DEET does not have a great effect on exposed skin areas more than a few inches from where you apply it. DEET based repellents can damage plastics, acetate, spandex, or nylon. Be careful with tents, jackets, backpacks, and other belongings made of these materials. To reduce some of your need for DEET, avoid perfumed and scented body products (shampoos, deodorants, cologne, etc. ), because they attract many insects. Also, ingesting large amounts of potassium and/or sodium can increase the amount of carbon dioxide you produce, thus making you more delectable to mosquitoes. Nontoxic alternatives... The new products containing the ingredient, "Picaridin" are clearly the best natural alternative to DEET. See the reference at the top of this page. Light repellents like "Skin-So-Soft" citronella lotions definitely have some effectiveness. B vitamins, however, don't hold up well in any studies I have seen. Also, products which contain the relatively nontoxic insecticide, Pyrethrum (not Permithrin) can be applied to clothing, netting, tents, etc. This stuff survives `laundering and sun to remain effective a week or two, and does kill skeeters and lots of other nasties. Pyrethrum is NOT a repellent, but is great to use in combination with a good repellent. It also does not damage fabrics like DEET is known to do. For folks stuck in an intense mosquito zone, it might be worth noting that people using Pyrethrum sprayed clothing and a 35% DEET spray on their skin showed a 99.9% protection rate against bites. In this study, unprotected persons received an average of 1188 bites over the same 8-hour test period. Yikes! "Bite Blocker," "Buzz Away," "Natrapel" and "Skin-So-Soft Bug Guard" seem to be some of the better rated nontoxic repellents. 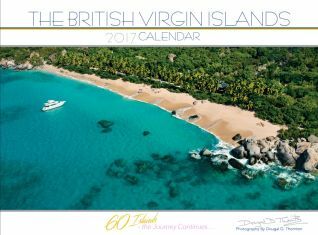 Clicking on any of the items below will take you to my "Sales Page" where you'll find many books and MANY other BVI-related products. 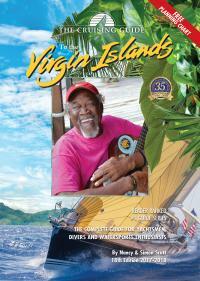 For lots more "Hot Tips" and Links for the BVI click here.